This online engineering calculator will determine the Axial Load Capacities of a Single Plate. This calculator does require a jave enabled browser to function. The equations utilized within this plate deflection calculator are shown at the bottom of the webpage. In the case of bracing gusset plates, the concept of the "Whitmore Section" may be used to determine the effective height of the gusset plate to be used in analysis. 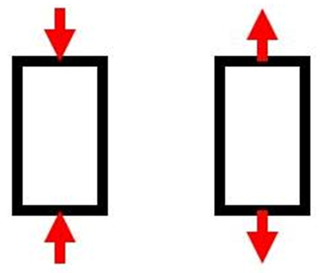 The "Whitmore Section" consists of the total effective width at the end of the brace as determined by drawing 30 degree lines spreading or fanning outward from the point where the load is initially delivered to the gusset plate from the brace and continuing to where these lines intersect a line parallel to and at the end of the brace. In the case of a bolted brace, this would be from the first row of bolts to the end of the brace. In the case of a welded brace, this would be from the beginning of the welds to the end of the brace.